Just finished the central panel of the Layer Cake Quilt. 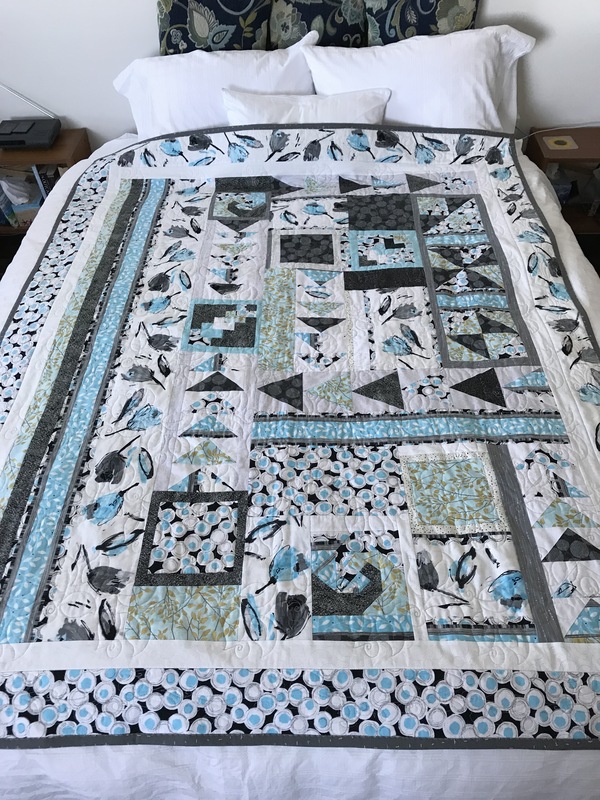 I had two challenges with this quilt – the number of small pieces (408) and making the fabric I had on hand go as far as made sense in the context of this quilt design. 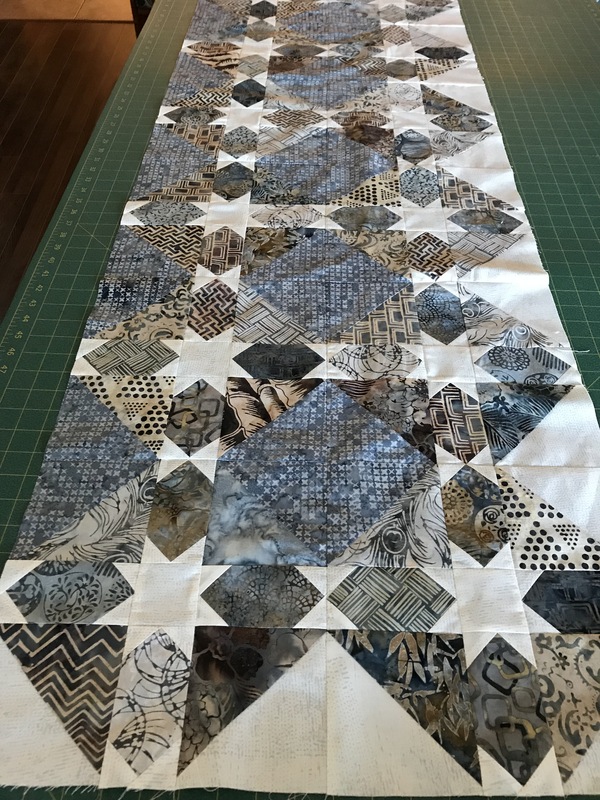 Total number of fabric pieces in this 4 x 6 quilt – 600! Given the fiddlely work with the 1 1/2″ white squares I’m surprised that my points work as well as they do! Not 100% perfect, but close enough that when the final quilt is quilted the slight imperfections are not going to be noticeable. Now I need borders. I want to introduce a contrasting colour. 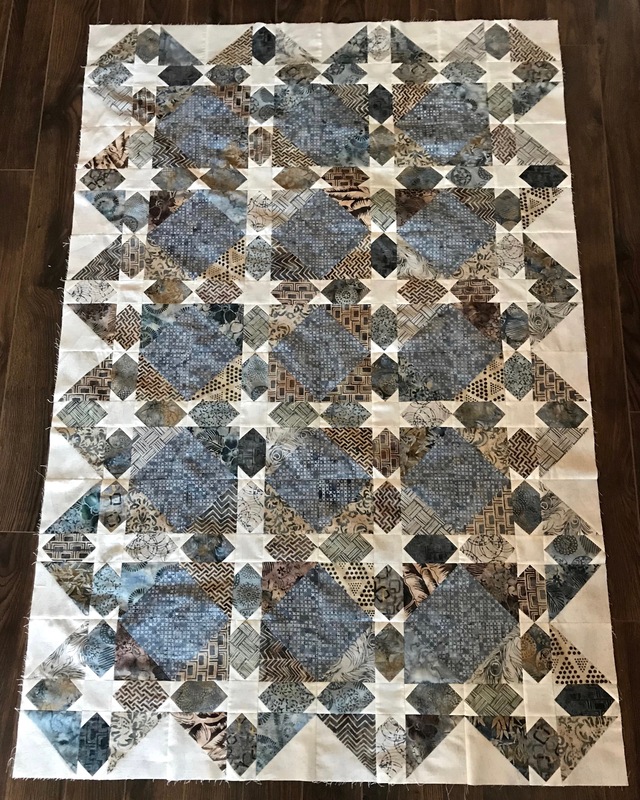 I have some 4 1/2″ batik strips that bring out the rusty/beige colours in the central panel, but I think a wide border in that fabric will be too strong – I’m thinking a 1/2″ – 3/4″ border will be enough (the question is whether to piece the strip in or to create a narrow flange). The outside wide border will be the white Zen Chic fabric used in the panel itself. My problem is that I have, at the moment, just four 4 1/2″ strips of that fabric! My local shop has none left! I’ve ordered some from the Fat Quarter Shop online (they had what I needed, my other usual sources didn’t) but the fabric hasn’t yet arrived. So I’m on hold for the moment. I guess I can fill in the waiting time by going through my fabric stash and pulling out something for my next quilt…. Finished last evening. I probably worked on them for 10 days or so (same 25 hours it takes me – I just knit more each evening). I was given the yarn by one of the women in the Friday knitting group – she picked it out of a donations bin at her church, didn’t want to use it herself, but thought I might like working with it. The yarn (an older Regia pattern) looked pretty dull, someone had knit and unravelled a portion of it, but I thought the yellow offered some possibilities, so I added in the yellow stripe at the top, alternated rows for the next 10 rows, then knit the remainder of the sock as the yarn worked out. Cuffs, heels, and toes all used a bluish grey which blended well with the greys in the yarn. Not a bad looking sock. Turned out to have more life than I’d anticipated. I finally finished Sailboats In The Morning Fog – in time for the Tuesday class this past week. That involved the thread painting on the boats and their reflections in the water,and a bit of movement in the water on the right side of the harbour. Next I added a matte done in white muslin, followed with a dark grey piping, and finally a wide border/frame. 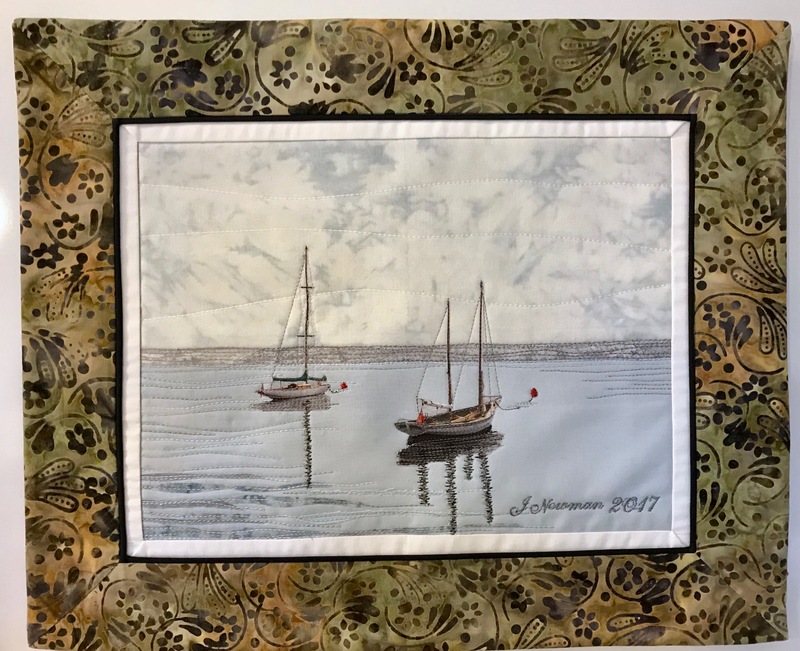 I tried several different fabrics, some quite muted but in the end went with this one which brought out the greys of the reflections as well as the wooden insides of the boats. I used the two remaining strips of border fabric to create a hidden binding. At class the gals all got their work close to finished (except for the hand sewing which they were going to do at home). 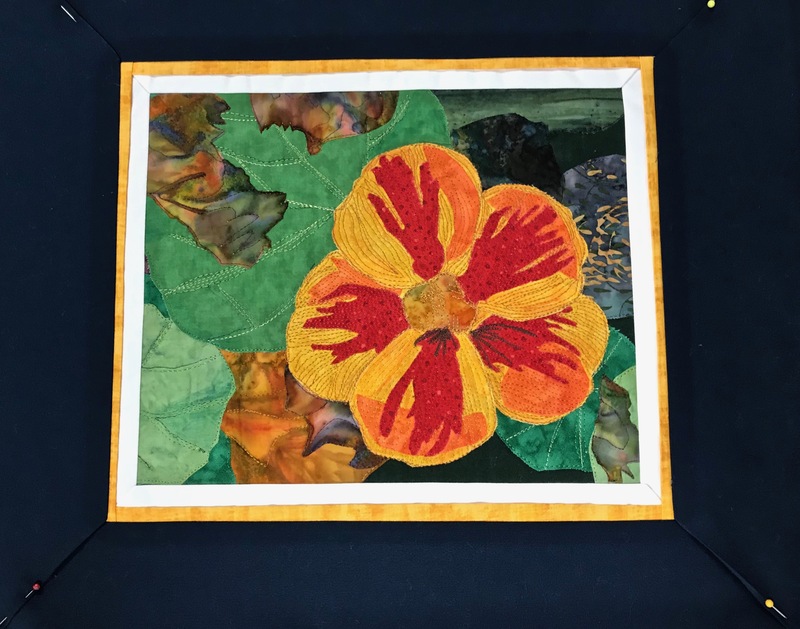 Linda had done the thread painting on her Nasturtium before she came. On Tuesday she added the white inner border, the yellow flange, and then the outer navy border. 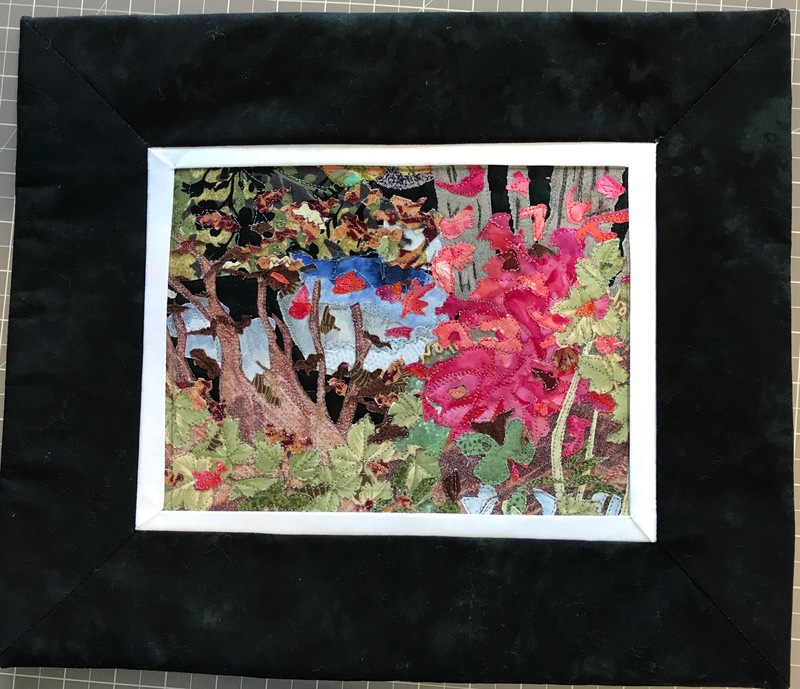 She added a hidden binding in the navy fabric she used for the outer border. 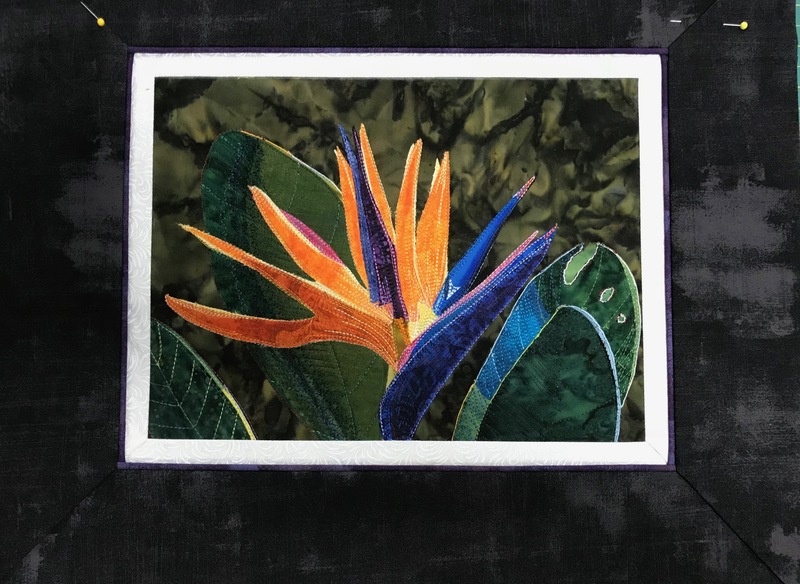 Deb’s Bird of Paradise also turned out beautifully. Although nearly invisible, the purple piping does pick up the purples within the flower and hinted at in the foliage. 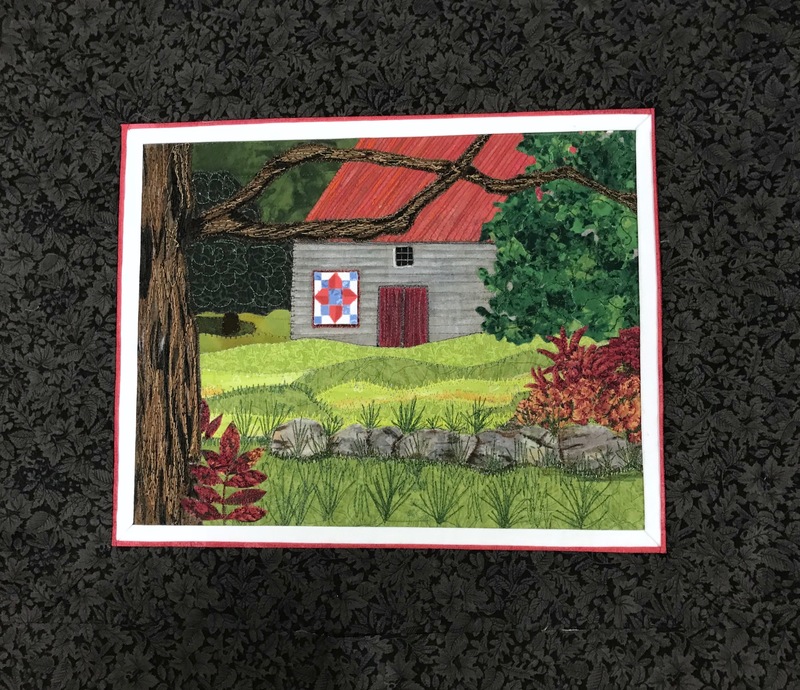 Pam did a lovely job on her wall piece Barn With Quilt – the thread painting, appliqué work on the tree on the left, created a very tactile bark. Faye’s Fall Walk captures the feel of a cool Nova Scotia fall day. The background was pieced and thread painted, the two figures were printed on fabric and applied to the scene. The red piping draws attention to the woman’s red jacket. Linda’s A Fall Day In The Woods brings the vivid fall foliage to life. Her framing of the scene strengthens the texture of the fall colours. The gals were (as was I) delighted with their work. I wanted them to get the finishing touches on their art pieces in class. We didn’t quite make it, but the remaining hand work was going to be no barrier to them completing their projects. 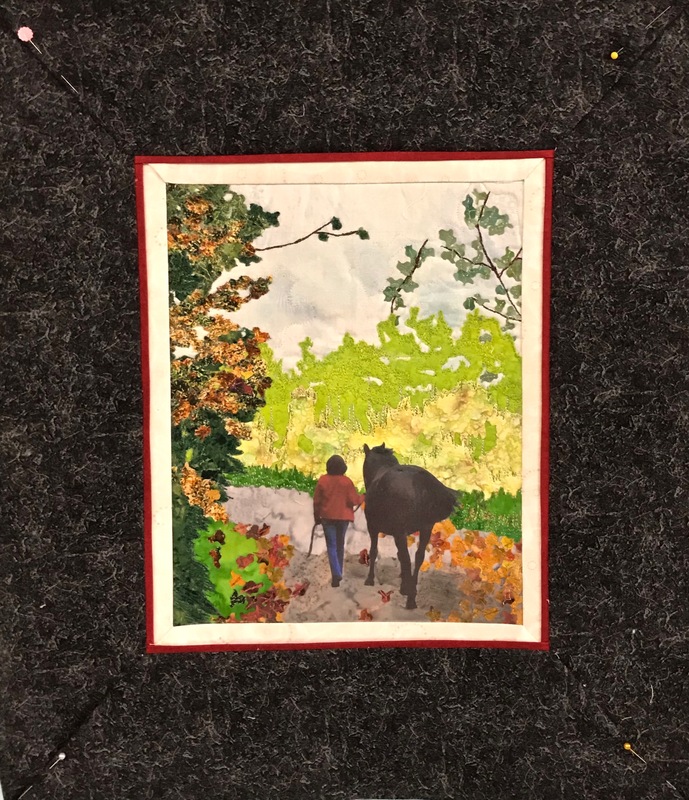 Yesterday, Melanie McNeil (Catbird Quilt Studio) posted a piece on pieced quilt backs. That got me thinking about the piecing I do for quilt backs. 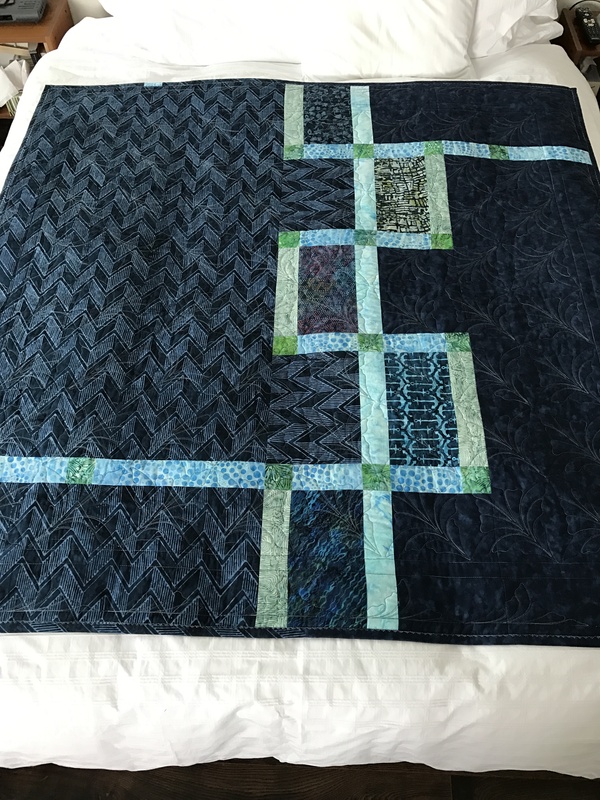 She says she prefers a solid back (her quilts are bed size) – I prefer the adventure of piecing (I generally make lap quilts). The challenge for me is to get away with a single length of quilt backing fabric and filling in the width with leftovers from the top, retaining something from the character of the top but at the same time creating a new piecing. 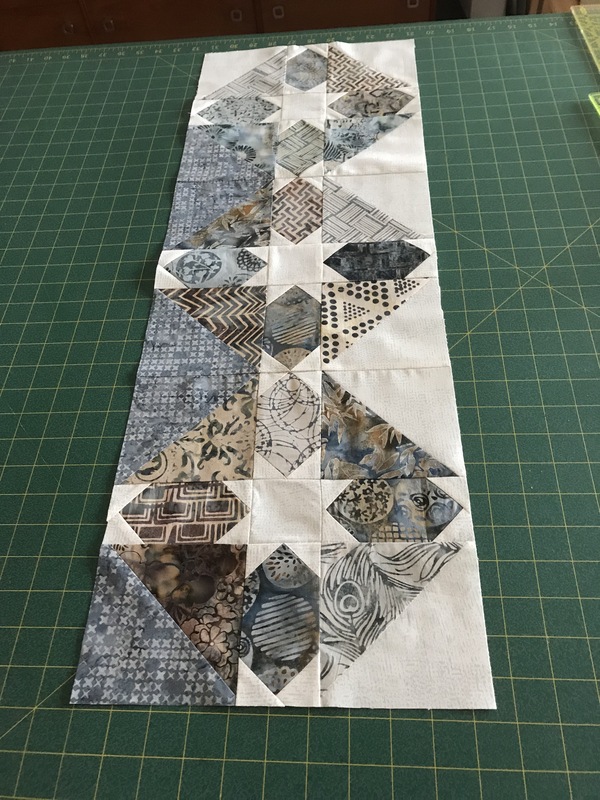 Most of my back piecing involves a wide strip, although occasionally I’ll do a block of some sort surrounded by backing fabric – it depends on just how much backing fabric I actually have to work with! 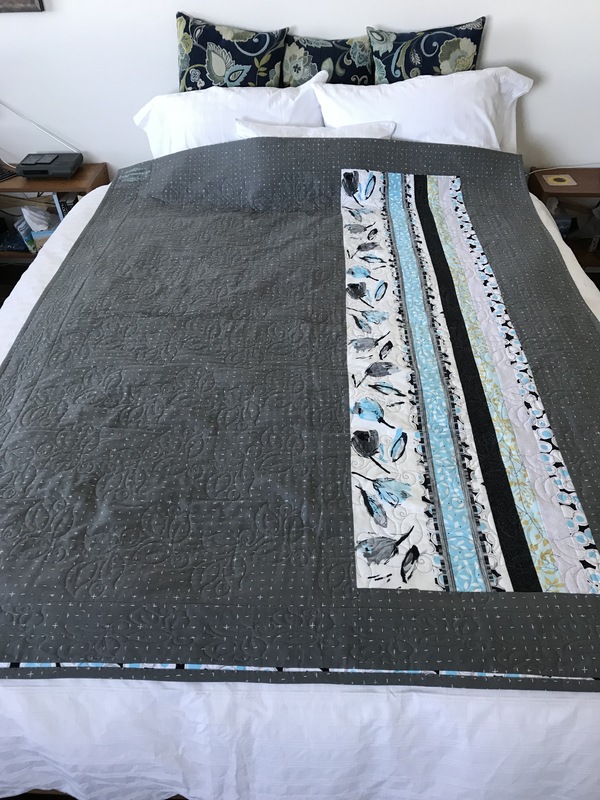 #1 – This is the latest quilt (Improv Quilt) – a strip/block because my strip wasn’t long enough and I fortunately had just enough backing fabric to border the strip converting it to a block. #2 – An opportunity to try some flying geese. 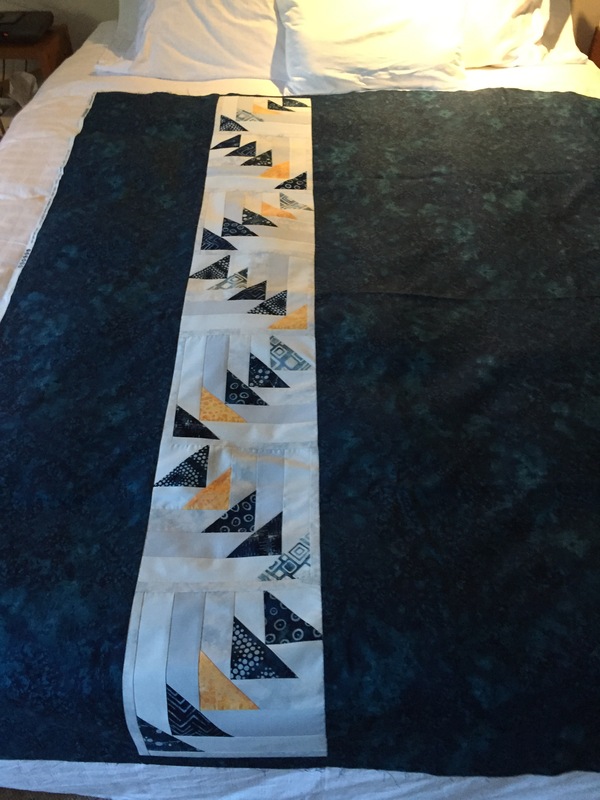 The original blocks were all in shades of indigo but I decided to insert one gold triangle in each and it made a huge difference to the strip. 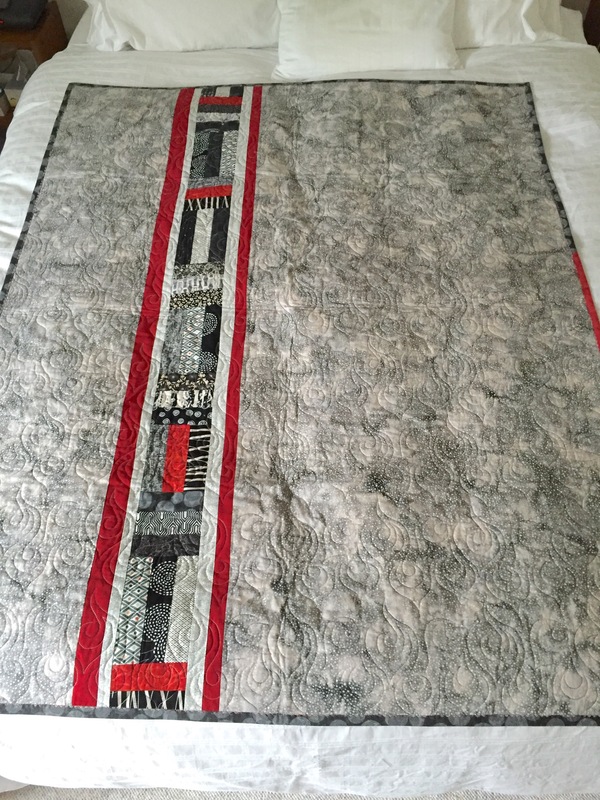 #3 – From the red/black/white strips quilt. The quilt top looks like three Venetian blinds with a red background. The grey backing reflects the fabrics used in the piecing from the top, with the red accents. #4 – This back was for the Starburst Quilt: I had no fabric leftover from the quilt top so I decided to use other indigo fabrics highlighted with the turquoise and green elements. 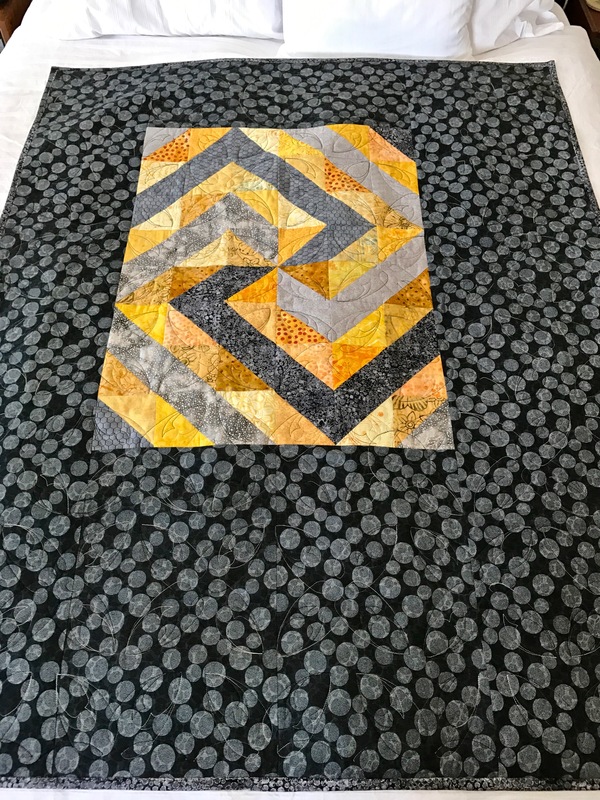 #6 – This is the back of the Medallion Quilt: I had just enough of the border fabric leftover to create these four mitred blocks. I decided to rotate them rather than keep them all facing the same direction. Spaced them out, offset top to bottom, with backing fabric because I had a lot of it. #7 – This back is from the Grey-Yellow Quilt: I had a lot of half-square triangles left over from the front. I decided to array them as a spiral. The panel is offset top/bottom, and left/right. 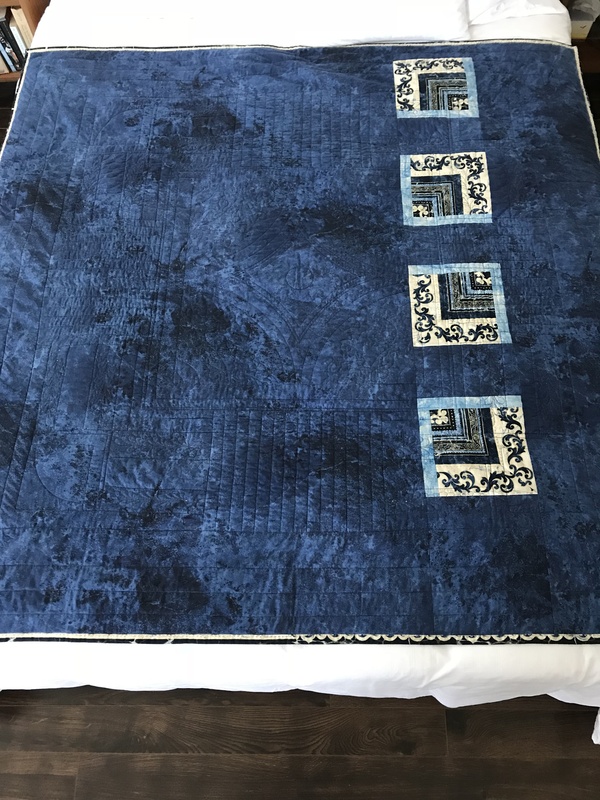 My quilts are all modern quilts – they need asymmetry to look “right”. 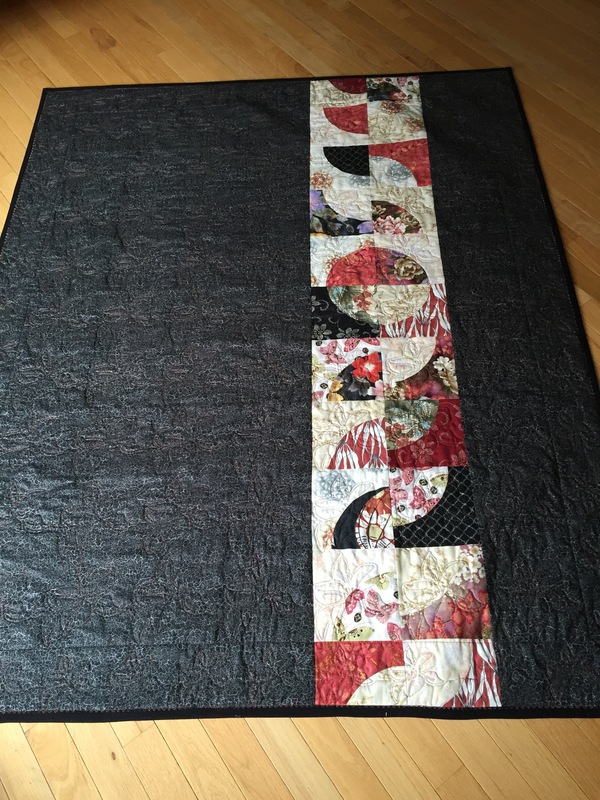 #8 – This back is from Improvisation #6 – Asian fabrics, drunkard’s path quilt. I had several slightly smaller blocks left over. I decided to do a more conventional drunkard’s path layout with single complete circle near the top of the strip. 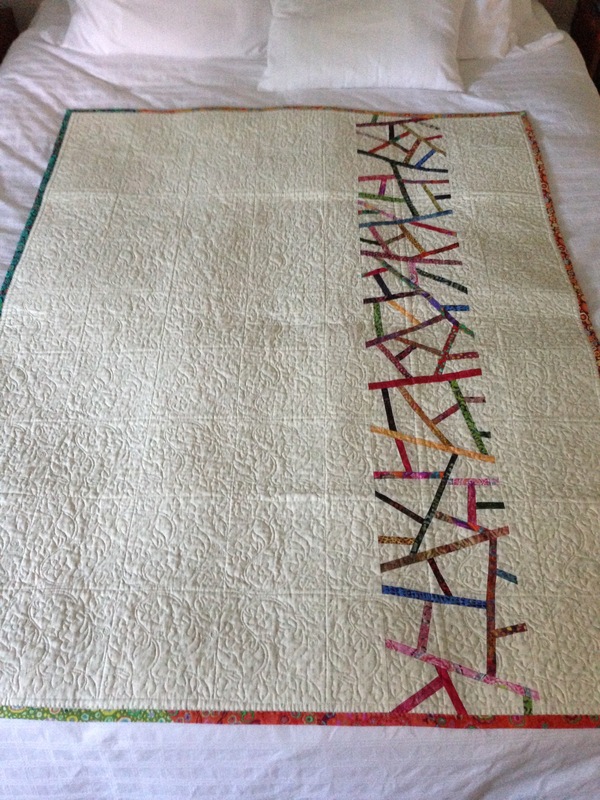 #9 – The back of the Asian Strips Quilt: I did the piecing of the on-point squares, added the filler and realized I still needed border/sashing to offset the insert strip from the backing fabric. Obviously I have many more quilt backs I could showcase here, but these are enough to illustrate how I see a quilt back. 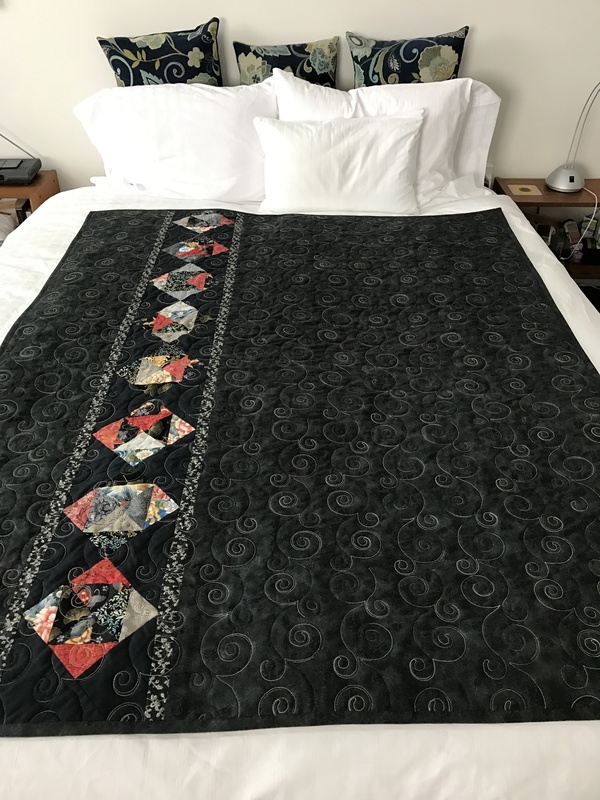 All of my quilts are “double” quilts – they can be used either side – for me, that’s part of the challenge/adventure of improvisational quilt making. 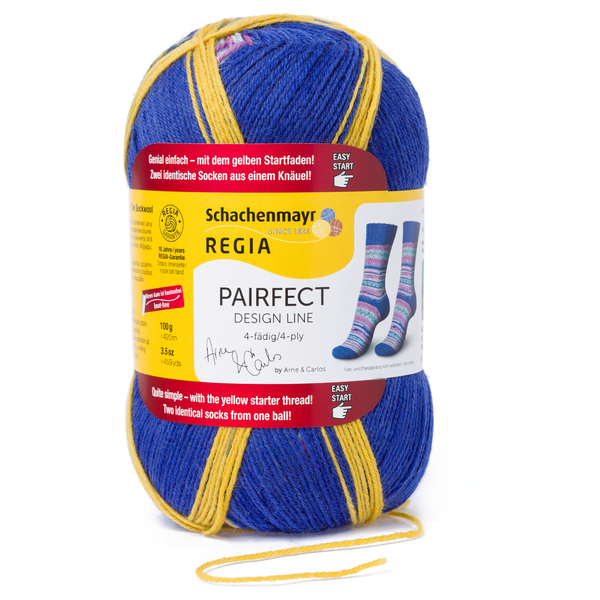 Schachenmayr, the company that makes Regia sock yarn, has had for the past few years a line called “Pairfect” – designed to created a patterned sock without any decision-making. I tried it when it first appeared and found it boring to work with – very dull patterns. This season the variegations looked like they’d be more interesting with clearly different cuffs, heels and toes. 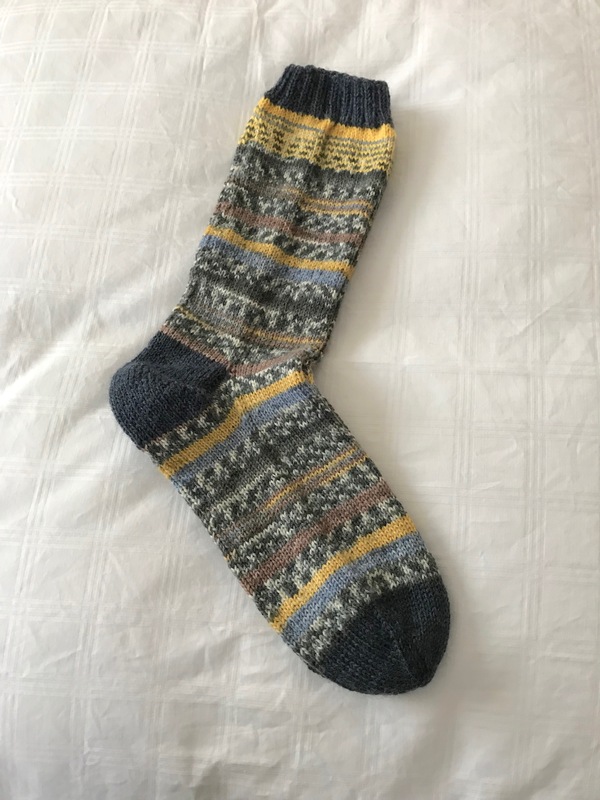 Still just as boring to knit – no decision-making required – the yarn for the two socks is marked with a length of yellow yarn (intended to be discarded – or saved for another project). When making the first pair using the yarn a couple of weeks ago I changed up the design but then had to do quite a bit of reconnecting to be able to complete the socks. This time I decided to follow the yarn. 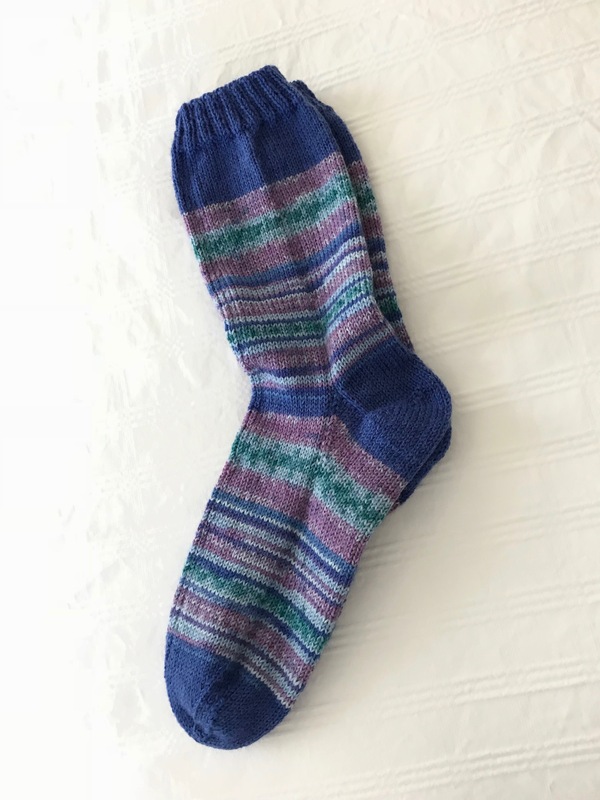 It knits up nicely but the part of the sock-making that I enjoy is deciding what colours contrast with my variegated yarn and where to insert contrasting strips, whether to change the heel colour, maybe even a third colour for the toes! So even though the variegated design changes and the repeat is a long one, there’s no creativity in knitting these socks. If you’re not an adventurous sock knitter then you’ll love this yarn because it does knit up a respectable patterned sock. I’m not going to use it again. Just done in time for my Tuesday Improv Quilt class. I did edge-to-edge quilting in the hoop on the central panel, then quilted the border separately. The inner section I treated as if it were a 6 x 8 pieced panel (using an 8″ x 8″ design which I set up using my embroidery software). That seemed to be the easiest way to do an overall quilting given that my building blocks were various sizes. I did not do any stitching in the ditch although I thought about it before I started the embroidery quilting. The back was pieced using leftovers from the top. I bordered the strip because it turned out the strip was shorter than I needed (that’s because I had added borders to the strip on the top side and this was all the fabric I had left). I like the effect and fortunately I had enough bits of backing to be able to do that. In the end, I had to return to the shop to buy another 15″ of backing fabric to bind the quilt. One last detail – I added a narrow strip of one of the top fabrics to one end to add another small accent. With label attached, this quilt is completed.